Here is the recipe to make Instant Mango Shrikhand Recipe | Amarkhand Recipe| Mango Greek Yogurt Dessert with an easy step-by-step video tutorial. Mango shrikhand is an Indian confection which is basically a creamy, rich tropical flavorsome yogurt based dessert. This shrikhand is served chilled with some hot pooris, or serve as it is, as an after meal dessert. 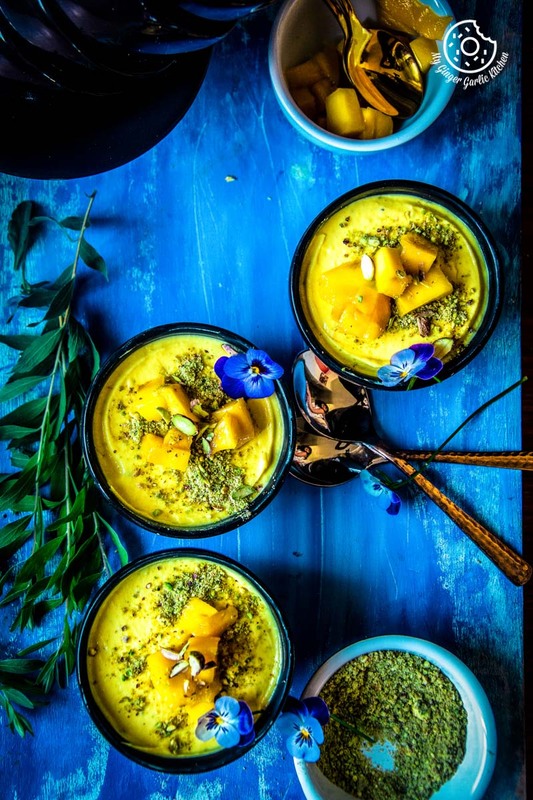 This chilled, luscious, and smooth mango flavored dessert is made with delightful creamy yogurt and sweet mangoes finally ornamented with pistachios and mango chunks. Why I decided to make mango shrikhand, and why you should too? Do you remember about my love for mangoes in my last posts of mango ice cream and mango kulfi? We Indians do love mangoes to the core, so do my family and I. This year we have got some good quality of mangoes here. Thus, I decided to consume all of my favorite mango desserts this season. 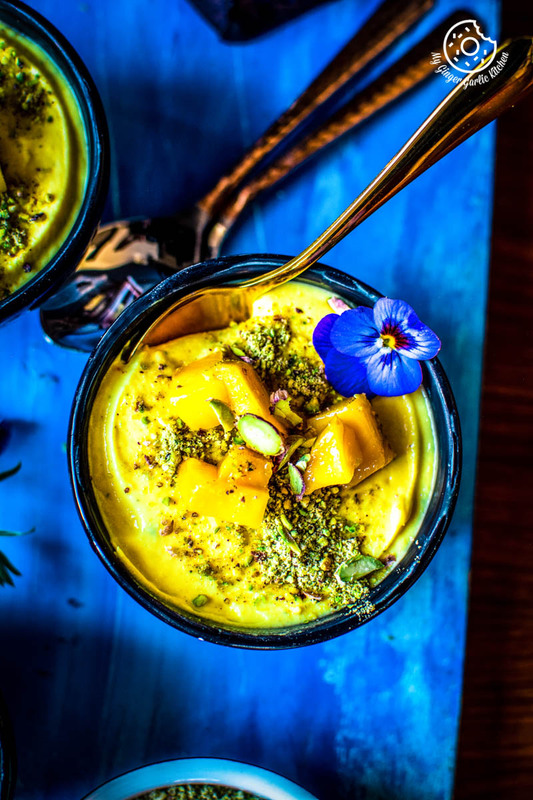 This mango shrikhand is certainly one of my favorite seasonal summer mango desserts. Doesn’t it happen that when you love someone, you love them unconditionally? You only see good things in them. It’s the same feeling as me when it comes to mango dishes. I do love mangoes regardless of their type, shape, color or size. I must admit that I have started loving this exotic fruit even more over the past years, considering the fact that mangoes are not easily available in my part of the world. What is Shrikhand (or Srikhand)? A basic Shrikhand is a sweet dish prepared by using strained yogurt and usually flavored with cardamom and saffron. You take hung curd in a mixing bowl. Then you add sugar and crushed saffron in milk. And whisk in a deep bowl until the sugar gets dissolved and yogurt becomes creamy. Finally, chopped nuts are added and then mixed again. Then refrigerated and served chilled. What is the origin of Mango Shrikhand? Mango Shrikhand, a yogurt fruit-based dessert is extensively eaten in all parts of India. It is believed that the origin of Mango Shrikhand is the Indian states of Maharashtra and Gujarat. This surely is one of the easiest mango dessert recipes which can be made without any hassle. Is it difficult to make shrikhand /shree kand recipe? Nope! Making this shrikhand doesn’t demand any complicated steps or cooking skills. You are only required to know how to mix using a hand mixer or a wired whisk. How should the Mango Shrikhand look and feel? It should look pretty yellow in color if you use saffron strands soaked in warm milk. I didn’t add any food color to this shrikhand, but if you want a deeper shade that you can use artificial yellow food color. What is the perfect consistency of a mango shrikhand? Mango shrikhand or Amrakhand is not very thick like Kesar Elaichi Shrikhand or plain shrikhand because it contains mango puree. I prefer 1 cup fresh mango puree for 2 cups ‘Matha’ aka ‘Chakka’. 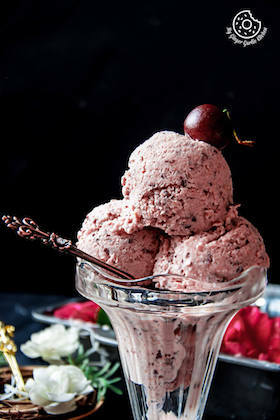 To get the thicker consistency like a store-bought shrikhand, I would recommend using chilled ingredients. After making it, make sure to refrigerate it for at least 30 minutes. This would give your Mango Shrikhand a nice creamy and thick texture. What is Chakka / Hung Curd / Matha? Chakka or Matha is a literal translation of strained yogurt. Traditionally matha (chakka) making process takes time. In this process, yogurt is tied overnight in a muslin cloth to strain the whey to get the thicker consistency of yogurt. This process will drain all the liquid and you will get the desired Chakka (Matha) aka Hung yogurt. 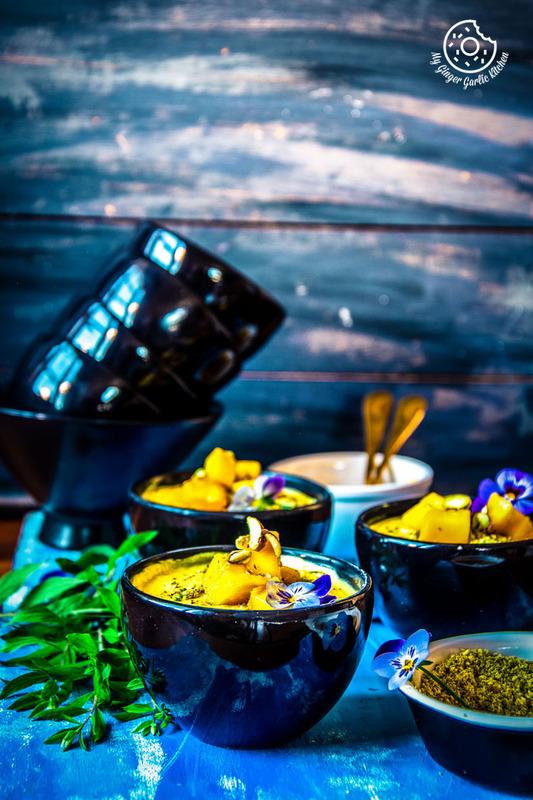 What type of yogurt is best for this Mango Shrikhand recipe? For making a good mango shrikhand or any other shrikhand, you should always find and use the creamiest yogurt. Creamier yogurt ensures that the shrikhand would come out rich. I personally prefer full cream yogurt for making shrikhand. How to make an instant version of Mango Shrikhand? If you don’t have time to go through such a long process of making matha then you can easily make it the instant way by using thick. For making instant mango shrikhand recipe, I would suggest you use full cream Greek yogurt or full cream Turkish yogurt. This way you don’t have to wait overnight to get hung curd. By using full-cream Turkish or Greek yogurt, you’ll get your hung curd in just 30 minutes. How should you serve Mango Shrikhand? Shrikhand tastes best when chilled. So you can prepare this in advance and chill it for 30 minutes to 2 hours or overnight in individual serving bowls. When it’s time to serve, just take out the bowls from the refrigerator and serve. This exotic dessert is easy to prepare and Shrikhand is often served with poori or paratha. But I like to serve it as a dessert after dinner. Either way, it’s super yummy. And making it is super easy too. 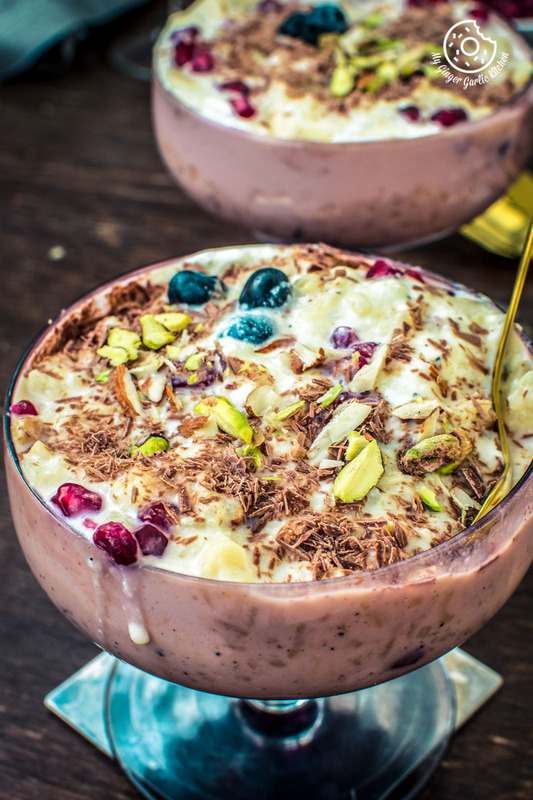 If you love any type of Shrikhand, you will instantly fall in love with this dreamy and creamy dessert. Do you want to know more about the different flavorings of shrikhand? There are so many ways to flavor this yogurt dessert. 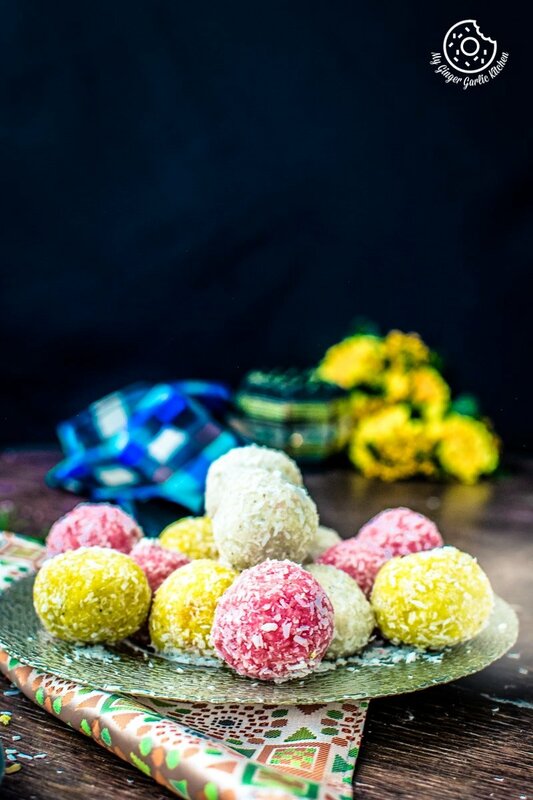 Some of them are Kesar Shrikhand (केसर इलाइची श्रीखंड), Mango Shrikhand or Amrakhand (आम्रखंड), Elaichi shrikhand (इलाइची श्रीखंड), Kesar Shrikhand (केसर श्रीखंड), Pista elaichi shrikhand (पिस्ता इलाइची श्रीखंड), rose shrikhand, and strawberry shrikhand. How long does it take to make Mango Shrikhand dessert? If you are making mango shrikhand then it takes 8-10 hours of making hung curd, and 10 mins for making shrikhand. It doesn’t need so much of your labor. The only time-consuming part of Amrakhand preparation is making hung yogurt. If you are making this recipe the instant way (with greek yogurt), then it only takes 30-40 minutes, which also includes the time required to make hung curd. So that way is super fast. Is Mango Shrikhand suitable for parties? 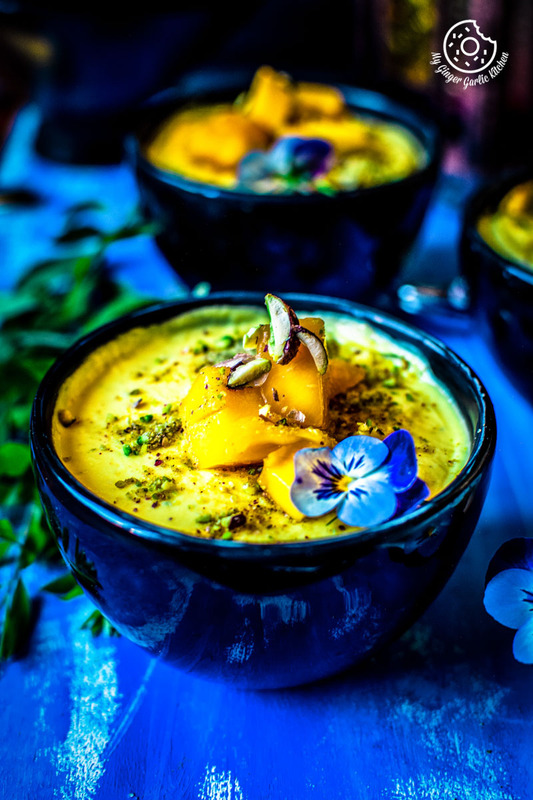 This mango shrikhand surely makes a wonderful party dessert. That’s why it’s so famous during Indian weddings. Not only this looks so presentable and cute, but it also tastes divine. 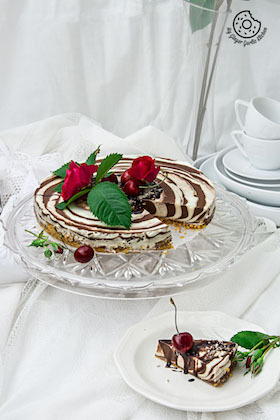 Make this easy dessert for get-togethers and I guarantee that your guests will surely enjoy this. What type of flavorings should I add to get a balanced taste of mango shrikhand? Shrikhand is never complete without a hint of cardamom powder. Cardamom powder is a must for shrikhand. 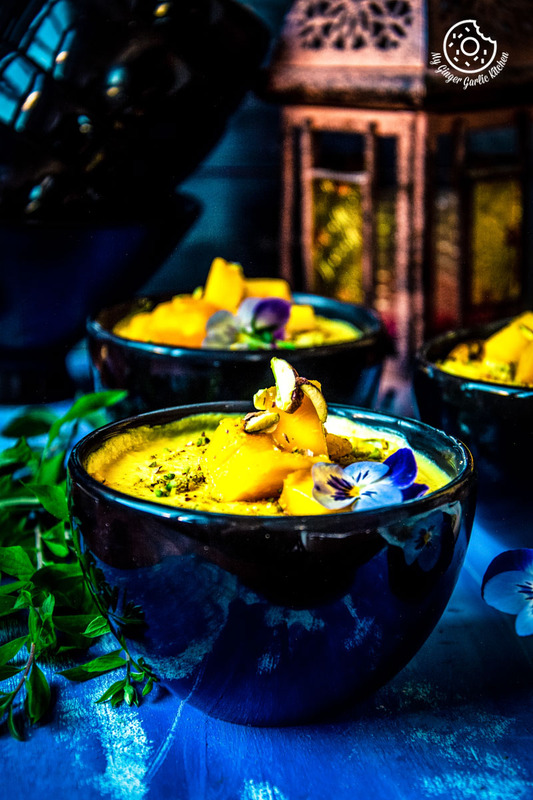 To enhance the flavor and color of this Mango Yogurt you can also add few saffron strands. 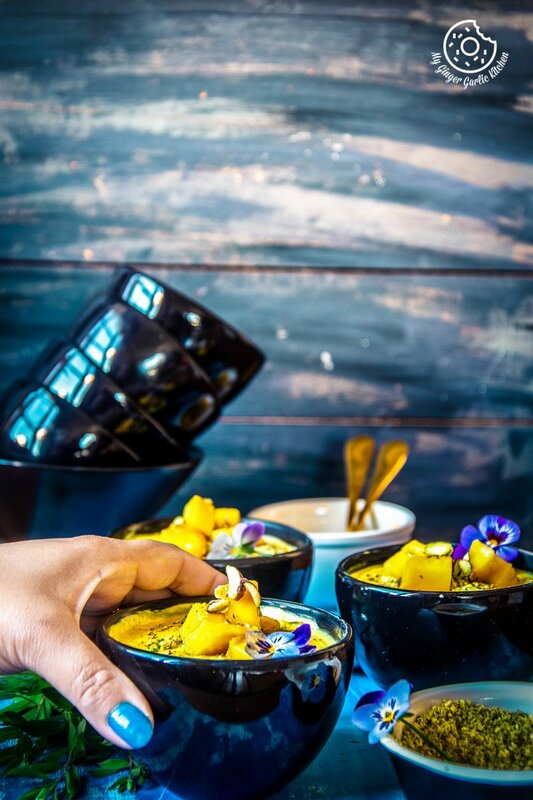 Saffron and cardamom flavorings perfectly balance the mango flavor. I have added ¼ cup of powdered sugar for making this mango shrikhand. However, you can increase or reduce the amount of sugar according to the native sweetness of mangoes or according to your taste buds. This is the only mango shrikhand recipe video you’ll ever need to make a super easy, most creamy and delicious mango shrikhand. What else can I make with mangoes? Mango shrikhand is an Indian confection which is basically a creamy, rich tropical flavorsome yogurt based dessert. This shrikhand is served chilled with some hot pooris, or serve as it is, as an after meal dessert. 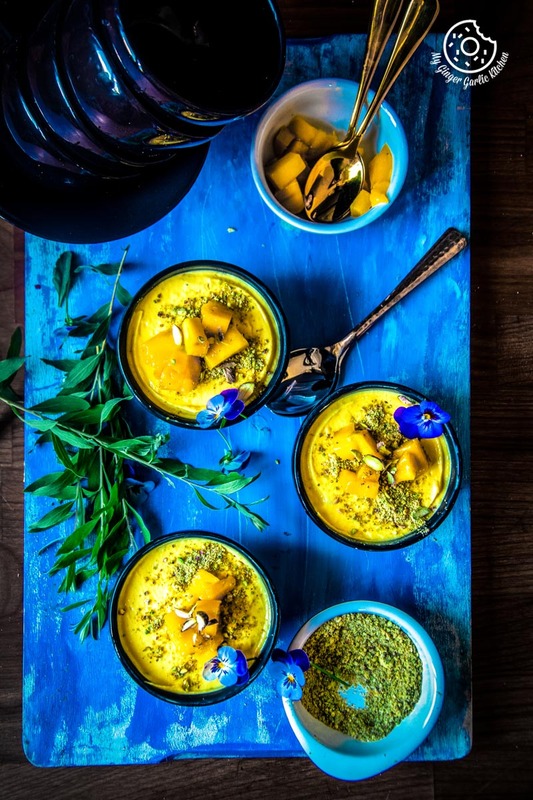 This chilled, luscious, and smooth mango flavored dessert is made with delightful creamy yogurt and sweet mangoes finally ornamented with pistachios and mango chunks. 6. 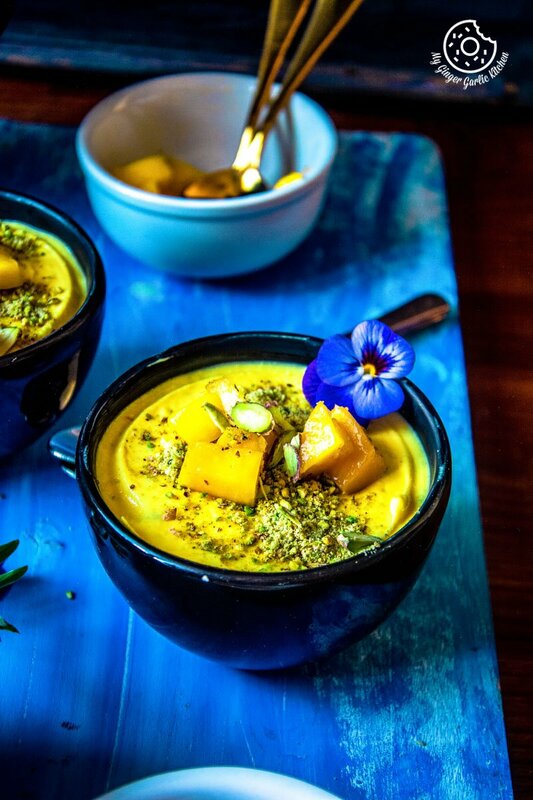 Add mango puree, cardamom powder, sugar, saffron strands soaked in 1 Tbsp warm milk, and whisk well until sugar is dissolved and yogurt becomes creamy. 8. Garnish with pounded pistachios and mango chunks. 9. Chill for 30 minutes to 2 hours before serving. 1. I have used homemade mango puree using fresh mangoes, but you can also use canned mangoes or mango pulp. 2. You can increase or reduce the amount of sugar according to the native sweetness of mangoes or according to your taste buds.